We pride ourselves on our commitment to providing the highest level of customer satisfaction possible. Many of our customers have told us how happy they are with the quality of our craftsmanship and the high level of service we provide. Some of our customers have been generous enough to let us publish their kind words on our website. My original slate roof was leaking in two places and I was keen to get the repairs done so I could decorate the rooms damaged. I was frustrated at builders either not turning up to quote, or then coming to estimate and not providing a quote! 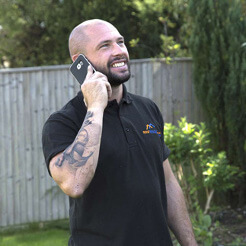 Mark was the only tradesman who turned up on time and gave a professional opinion and advice and written estimate. He went out of his way to carry out the roof repairs when it was convenient for me. Would highly recommend. 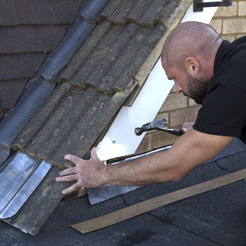 I had Roof Rescue replace my flat roof and cannot praise their manner, work, cleanliness, politeness, punctuality, cheerfulness and professionalism more. They explained fully as they went along as to what they were going to do and showed us photos of the ongoing work. Previously I had used another local roof company to fix a problem and they had to come twice as after the first visit there was still a leak: they let me down by charging me and not doing the work hence the same problem ensued, so trying Roof Rescue and finding them so good was a huge relief and I will use them again to fix this one. I have no hesitation in recommending them. The work Roof Rescue did, replacing gutters and fascia on my Mum’s house and acting and adapting work on site to address years of “making do” was excellent. The quality of their work was, to me and to my Mum, equalled by their polite, friendly and expert approach and attitude to working with us to deliver what we wanted. The father and son duo of Roof Rescue were a delight to have at our home, repairing the roof. They kept us abreast of all work being carried out, provided us with a detailed quote and the work needing to be carried out. As always with an old house things are not always so straight forward and they ran into trouble along the way, but faced it with a smile. The workmanship was superb, and they tidied up after themselves every day. Thank you for all the work you’ve done to our roof. We are both really pleased with it. You’ve done a great job and you’ve been incredibly professional. Thank you. Roof Rescue have done a fantastic job in replacing my roof from start to finish. They are professional and take pride in their work. Mark has been easy to work with, he listens, explains, and then does what he says. The quality of work has been of a very high standard and the whole experiences has been made really easy because of it. Thank you, Roof Rescue, for all the work you’ve done to our roof. We are both really pleased with it. You’ve done a great job and you’ve been incredibly professional. We are loving our new roof. We had a complete overhaul and it was a big job. The guys carried all the work out with a great attitude and professional all the way. They were approachable on each stage and were very flexible and understanding on some of the unforeseen issues that arose. Highly recommended, thanks very much Mark and Mark! We are extremely pleased with quality of the workmanship and the professionalism of Mark and the crew at Roof Rescue. We had work needed on three different roofs and our initial quote was very thorough. During the time the work was underway there was minimal disruption and we were kept updated regularly. At the end of the each day’s work the site was cleared and clean. At one point they even responded to an urgent visit after the recent snowfall. I would highly recommend Roof Rescue and will not hesitate to use them again. Can’t say Thanks enough! It has been an absolute pleasure to have Mark and his Roof Rescue team working at our house. Our roof was well over due to be fixed from a previously bad fitting, and they provided us with a very in depth and professional quote for our new roof. Their work area remained very neat and tidy throughout and went out of their way to ensure we were ok during the days that it snowed and during the rain downpour. Our house is much warmer now that we have a properly fitted roof and skylight. Their finished work looks outstanding – Thank you. We couldn’t be happier with the service and the quality of the work that we received from Mark and the team. They replaced our entire roof with as little disruption as possible and it looks fantastic. They were more than happy to answer any questions as the project progressed and kept us updated on progress throughout. I wouldn’t hesitate to recommend roof rescue. Professional, reliable, trustworthy and honest family run roofing company. Have recommended to the rest of our street, after they admired the work carried out by Roof Rescue. Top quality work from roof rescue, went out of their way to help me complete a job!! Very friendly and officiant! Highly recommended!! Cheers Mark. Absolutely tip top service and great, hard working guys. Would highly recommend. I have used Roof Rescue twice now and both times they have gone above and beyond with their work. I regularly recommend them to my friends and family and I will continue to do so as I’ve been extremely happy and impressed with the work they have undertaken for me. The first time I used them was for some new flashings and re-pointing for my tiled roof which was leaking when we had wet weather. Since having Roof Rescue do the work I’ve had no problems at all. 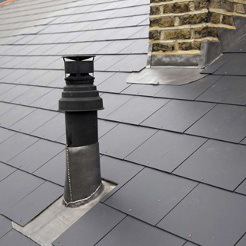 After the work they had previously done for me I didn’t hesitate in deciding to use Roof Rescue for a second time when I needed a new flat roof for an extension I had done. The work was of the highest standard and I’m very pleased with the outcome. Whilst having Roof Rescue do the work I found them friendly and punctual. Their price was very competitive compared to others and I will without doubt use them again in the future. Finding out we were expecting our first child just as our roof gave up for good was far from ideal! After being told it would be best to replace the entire roof, Roof Rescue were absolutely brilliant. Not only did they give us an honest and extremely competitive quote, they then carried out the work quickly and to an extremely high standard. Mark was a pleasure to deal with, completely took all the hassle out of the job and I completely trust the work he has done on our property at a time we needed to guarantee we’d have a dry roof over our heads!!!! I would (and have) recommended them to anyone. I just had my roof replaced by Roof Rescue. Everything went as planned from start to finish, I cannot be happier with the service and highly skilled workmanship I received. I would recommend them to anyone with a roofing problem, you won’t be disappointed. We just wanted to say what a fantastic job you guys done on our new roof. We are so pleased with the way the job has been finished to such a high standard. Thanks to Mark for helping us out when trying to pick the colour for our tiles, they look great. We will be sure to recommend your company. Thanks again. We have recently built a new office on the site of our old garage. 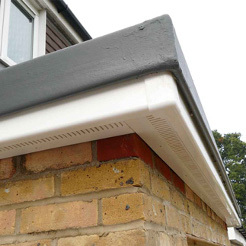 We chose Roof Rescue to do the felt flat roof, fascias, soffits, guttering as well as a fibreglass roof to our new porch. To say that we are delighted with the work would be an understatement, the whole process from start to finish was excellent – we had a really detailed quote so we were clear on the work that was being completed, the work was completed exactly when needed and Mark liaised with the other trades on site to make sure that he knew when the job could start (which was a great help so I didn’t need to). The finished result is excellent, there were some challenges along the way, which no-one could have seen (we decided to add 4 roof lights in at the last minute!) and Mark and the team just dealt with them, they kept me in the loop and still finished on time and at the price quoted. All in all, I am a seriously happy customer, the work is first class and the guys were a delight to have working here. This Roofing Company, RoofRescue.co.uk was a gem of a find. I asked four largish companies to assess and estimate to put right problems I had with crumbling and falling rendering on two ten feet tall chimneys on my Edwardian detached house. Roof Rescue gave by far the best analysis and plan for dealing fully and long term with these crumbling chimney renderings. They followed their plans, and the craftsmanship employed was of the highest standard. 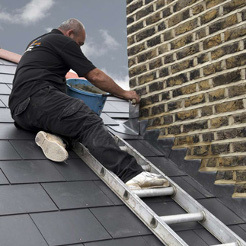 In the event they proved to be the best choice of roofing company. In addition, their estimates were very competitive. At my request they inspected the condition of all aspects and regions of my large roof, the gutters, fascia board etc. as well as my three other chimneys. Using photos that revealed some key roofing problems which were arising, they suggested appropriate plans of work to put these right in the long term, most of which proposals I adopted. 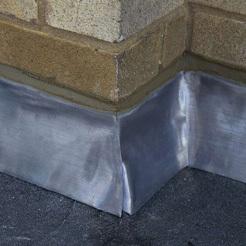 These ranged from re-flashing all of the chimneys with the appropriate thickness of lead, replacing wet-rotted fascia boards with little future, to refitting loose and dangerous coping stones on a garage roof parapet wall, and replacing a cracking-up large lead roof apex covering probably more than 100 years old and made from too thin lead. In addition, they did an excellent job re-rendering two other chimneys on which the original Edwardian rendering had become hollowed in many places and was clearly due to start crumbling. From the attic Velux windows, on all sides of my house I was able to observe all of this work in its detailed progress from beginning to end. They were always prepared, when asked, to patiently explain all details of the work and provided multiple photos of the condition of all of the structures before and after repair. The team were not only excellent craftsmen, who took pride in doing the job well, they always worked very efficiently, clearing up behind them as they went, and they allowed time to clean- up the site before leaving for the day. They were all very friendly, accommodating and co-operative. Mark Corneille has excellent communication skills, and day to day progress was reported personally and by email. On the job they were always outstandingly punctual in arrival, and took short tea and lunch breaks. They always stayed late when it was necessary for particular job completion. 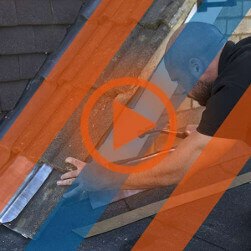 The Roof Rescue website (www.roofrescue.co.uk) is impressive in its clarity and detail. I have found that the promises and quality it offers all delivered to the customer. I will always be prepared to employ Roof Rescue again for my own roofing problems, and would not hesitate to recommend them to others. We contacted Roof Rescue to help remedy our leaking gutters. They responded and visited our property on the same day, provided a competitive and detailed quotation and the works were carried out swiftly and to a high standard. An honest, friendly, professional family run company we would not hesitate to use them again and recommend to our friends and family. RoofRescue (Mark and Mark) renewed a flat roof for me. I was very pleased with their work; they were polite, friendly and tidy. When they had stripped the existing roof off they found the boarding to be dipping and rotten, they did forewarn me that this may be the case before starting the job. They took the time to show and explain this to me as they did everything else keeping me fully informed throughout the course of the job. Despite it being an extremely hot day they kept working until the job was finished. Sadly in this day and age workers do not always take pride in their work so it was very refreshing to find RoofRescue who do! They are going to do some more work for me later on in the year and I would have no hesitation in recommending them. RoofRescue.co.uk did a great job clearing out the central gutter on my Georgian butterfly roof. I liked that they kept me informed in detail of the roof condition, options of what work they could do and pricing. They gave me a batch of before and after photos that enabled me to understand the work done. Reasonably priced too. After a leak, Mark (RoofRescue.co.uk) responded very quickly and provided a quote with photos and was happy to explain and discuss the issue and solutions available to us. They then worked to get us watertight despite awful weather. They were happy to explain progress and took photos of the finished job for our records. Always polite, friendly and knowledgeable, worked quickly and tidily. I would not hesitate to recommend. A competitive, professional, reliable family company focused on providing an excellent quality end product & consistent service. I was extremely pleased with the end-result. The detailed initial quote, daily updates and accompanying photographs, e-mailed and texted to me along the way, meant I could keep a close eye on progress made throughout – an honest and hard-working duo. I would have no hesitation recommending Roof Rescue to my friends. 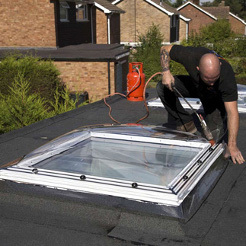 Following the purchase of a new house I contracted Roof Rescue to install two Velux Roof windows and complete associated works. I was extremely impressed with the efficient and professional service I encountered. The friendly nature of the contractors was reassuring and the works were completed within one day as specified. I intend to engage Roof Rescue in the future to complete additional maintenance works. Roof Rescue carried out a complete roof renewal to the main roof of our house, as well as tiled and flat roofs to our extensions. I have been very pleased with their handling of the entire project: their staff visited promptly to prepare an estimate which was as promptly submitted, and queries and requests for changes were dealt with promptly. The actual work was done with disturbance to the inhabitants kept to a minimum. Roof Rescues staff was very accommodating to client visits to the work site and to requests for additional work which was necessitated as the work progressed. Quotes were provided promptly for these extras. The invoiced amounts tallied with all quotes. Communication was good, the new roof looks good and – as far as I can judge this was complete to a high professional standard. What else can I do but to recommend this company strongly! We contacted Mark at Roof Rescue having been recommended them by a friend after we suffered some damage to our roof during some strong winds. Mark was able to get to us within an hour of us calling to temporarily make it water tight. Upon inspection, it was evident that the flat roof of the extension was in a poor condition and badly maintained by the previous owners. Having sought some quotes, Roof Rescue was extremely competitive. Within a week of accepting the quote, work had started. Mark and his team are professional, polite and extremely efficient. The 10 year guarantee also offers peace of mind. I would have no hesitation in recommended Roof Rescue.